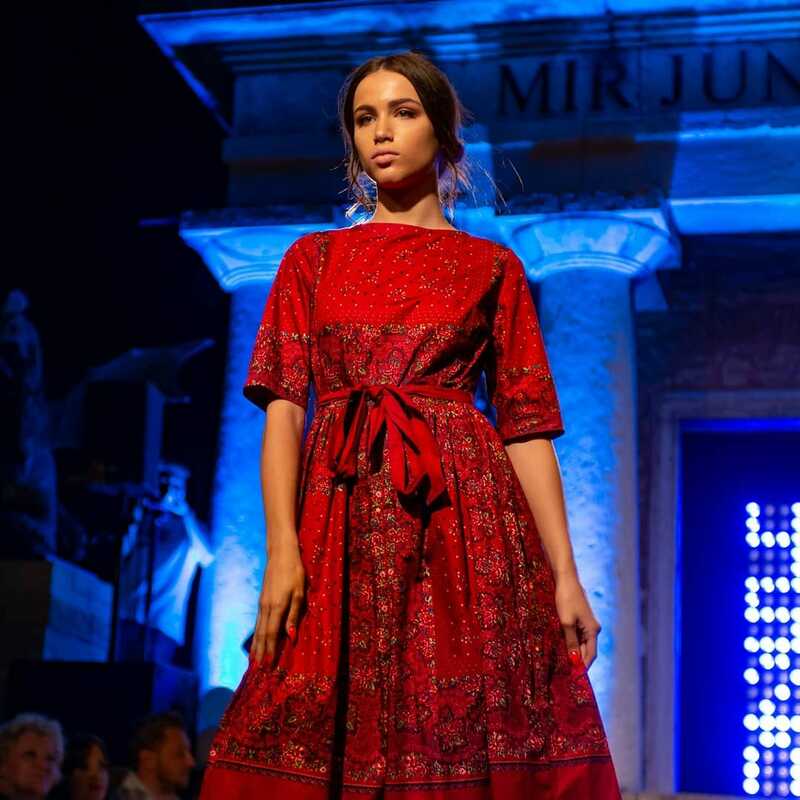 For the first time in Croatian history, Hunić Design Sisters have designed a dress using the famous Šestine scarf material (šestinska marama) or the so-called “ingliš scarf”, a red headscarf with a delicate flower design which was traditionally worn by married women on top of their heads. Ingliš scarf is a part of Šestine folk costume that is already branded in the world, and also by Hunić Design Sisters in 2013, when it won the world’s best folk costume award in Equatorial Guinea, where it was worn by Miss Tourism Andrea Jelena Baresic. The dress recently had its premiere in Rijeka, at the Riječka modna poslastica CITY 45 20 event. 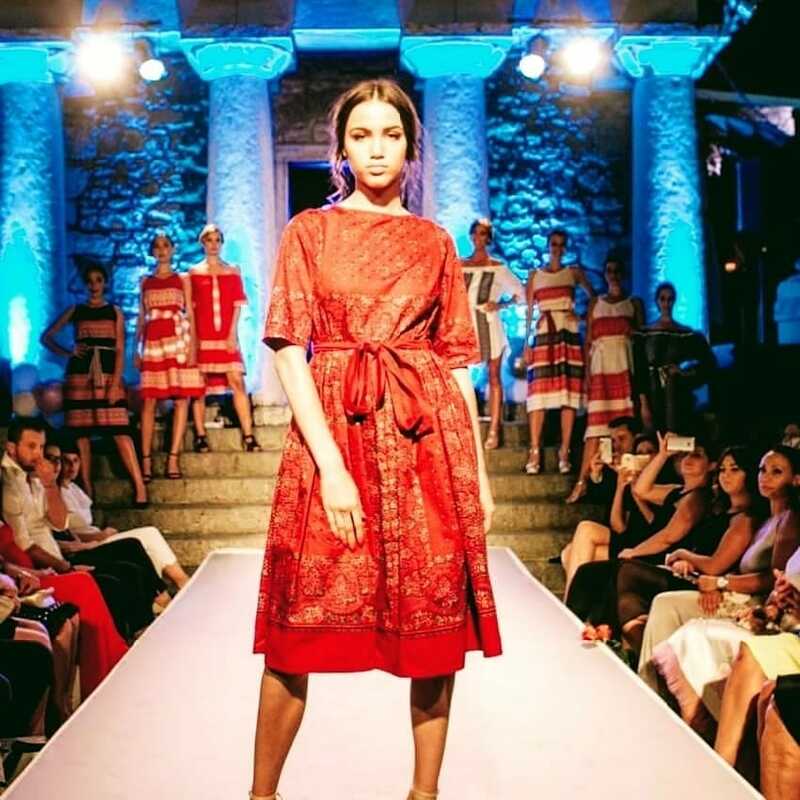 “Our goal is to preserve Croatian folklore garb and tradition and we think we have achieved that with this new dress featuring folk costume elements which present our country in the world,” the Hunić sisters say. Adrijana and Diana Hunić are sisters from Zagreb. The style of their creations are timeless, they combine the beauty of traditional dresses and contemporary women. Their love for the preservation of Croatian clothing has been passed on by their parents as the whole Hunić family shares the same passion for folk costumes, fashion and dressmaking. Over the course of years, it has successfully transformed into a successful business in which they invest a lot of love and effort in a family environment. Up until 2012 the Hunić’s only made folk costumes, and then the idea was born, through the newly created dress with material connected to Prigorje folk costume, they started to create contemporary clothes inspired by or using elements of traditional clothing or folk costumes.